CAN MALAYSIANS REALLY RISE TO THE CHALLENGE? WILL ALL THREE MAJOR SEGMENTS SELFISHLY PROTECT THEIR OWN TURF? Today I posted the Star's interview with His Royal Highness the Sultan of Johor on my facebook page.
" STOP POLITICKING WITH EDUCATION SAYS THE SULTAN OF JOHOR." Almost immediately it attracted responses from readers and all seemed to be very excited about it, responses came from almost every racial segment in our country and this shows that there is an anxious need for improvement in our education system. To see this improvement as suggested by HRH the Sultan of Johor, Malaysians have to rise to the challenge, a challenge that will demand sacrifices from every segment of our society. Are we prepared for it? The Sultan of Johor Touching the Hearts of All Malaysians. I will deal with those challenges and sacrifices in the later part of this article. As Technology picks up, we Malaysians are being left behind because our educations system has deteriorated to such low levels that even the IndonesianS and Thais are gaining on us to the extent they are now rated and our education system is out of the rankings, now if this is not cause for concern amongst us Malaysians I do not see what will be. One thing for certain through my years as a Human Resource Professional the standard of graduates in general churned out by our schools has deteriorated to such low levels that most of them will not get decent jobs overseas if and when the time comes, (it is almost certainly coming) when our children will have to seek greener pastures elsewhere like the Bangladeshis, the Indonesians and even the Thais are doing here currently. Our Industries have gone abroad and now some of the lower end ones are showing signs of returning to Malaysia, while the higher end operations move elsewhere. Our education system is not geared to create innovators, people who can invent, if there are Malaysians capable of doing such things they are overseas, their inventions benefit those countries and why should this be the case. Our pseudo socioeconomic policy has resulted in a backward Malaysia we placed our priorities in the wrong baskets and this has resulted in our backwardness. A very good example was the Rubber Research Institute of Malaysia the foremost centre of Natural Rubber Research in the world then headed by BC Shekar, a Scientist, a Malaysian Scientist he was shunned. If our Politicians and in particular Mahathir himself had seen it more worthwhile producing a Malaysian made automotive tire industry rather than a car (Proton), we would have had more success there, it was certainly the better bet, even today after all these years our cars are yet to be rated "indigenous technology" so much is still borrowed. We could have been one of the best tire manufacturers in the world but we chose to be one of the worst car manufacturers.\ in the world. Take the Electronics Industry, we stared in mid sixties with Matsushita starting a plant in Shah Alam making finished consumer goods, this was followed by the semiconductor industry in the early seventies and by the eighties we had become the world's largest Semiconductor manufacturer, the largest manufacturer of domestic Air Conditioners, and among the top 20 exporting nations in the world, then all failed. All failed because we did not produce enough sufficient local graduate of the quality required to innovate, invent and make and export Malaysian technology like the Koreans and Taiwanese have done even though they began long after us and all this can only be the case because Malaysia lacked sufficient talent, caused mainly by our education system. Some of our best talents from the semiconductor industry emigrated to the Silicon Valley where they made their riches, and in an effort to try a quick fix the government brought back a sprinkling of talent tried in their own haphazard way to create a Malaysian semiconductor industry, it and failed miserably. There are the great examples of our domestic Electrical products manufacturer MEC a huge flop, then there was this Company where a conman took the Government of Mahathir Mohammed for a ride, the firm called InventQjaya, Mahathir's brainchild, I called the number today and I got a frightening reply, "the number you just called is not in service." Whatever happened to the millions pumped into this organization by the government? We failed because the politicians were "politicking with education" as His Royal Highness the Sultan of Johor so rightly put it. They really do not care, it is a ignorant mass that will keep them in power and so they are busy making mine and your children ignorant, it is their assurance of remaining in power. BUT ARE WE AS MALAYSIANS READY TO TAKE IT? Yes, his highness has presented us with a right royal challenge one that should get this nation moving and one that will unite us with purpose as a nation of, one people in all our diversity. The question is are we prepared to make the sacrifices to pursue this challenge? Real sacrifices, sacrifices that will really challenge every Malaysian from every segment of our society. Are we prepared to cast aside our own selfish objectives of race and think of one people in all our diversity? Can we do that? Can we say No tho this? Can we say No to this? deprived to a student of any race wanting to study it, it will not be compulsory as a subject to pass, but compulsory as a subject to be taught to the highest of levels to those who choose to do so regardless of race. 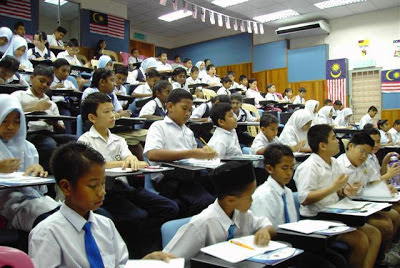 Bahasa Malaysia must be made compulsory, compulsory enough that one should get a credit in the language to pass the exam, it is the prerequisite for entrance into local Universities. English too will demand the same standards, so that our students will excel no matter where they go to further their eduction. has been the case all this while, educators backed by racial political parties. The only way to get over this is to make it clear to all that the corrupt and selfish politicians who benefited from such schemes had all sent their Children overseas to the best Schools in English speaking countries, whist the continued to promote vernacular schools here in Malaysia only for their own selfish purposes. Take a look at Najib's children, take a look at Hishamuddin's children and you'll find the answers there of course they are not the only ones it has been happening for generations. Can we see more of this? 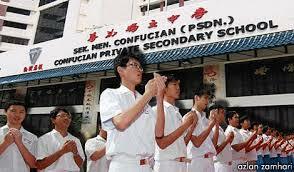 Some of the Chinese and Tamil elite send their Children to elite English schools but when it comes to local education they want Chinese or Tamil schools as the case may be.Schools. The local schools are the breeding grounds for local politicians especially the BN kind to create generations of ignorant people who will continue to support them. The Sultan has come out with a fantastic suggestion if the people can grasp and appreciate what His Royal Highness has said, if they value the education of their drench, we should be able to take it from there and I am sure he will not grudge us his moral support.